Concerned about the state of Social Security? 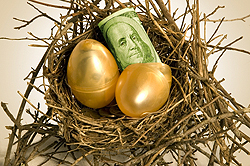 Possible Tax benefits, with contributions and/or earnings tax-deferred until retirement. When can I use my IRA Assets? Beginning at 70 1/2 distributions from a Traditional IRA must begin. Please contact our representatives for additional details and Information.